This very special serial, The Wheels on the Bus, is brought to you by the fabulous Mia Hayson and myself as a collaborative project combining our two individual specialties: Zombies and Thor, respectively. On this page, you will find links to each episode for your enjoyment! As the serial continues, I'll update the list for the convenience of any new or old followers-- generally new episodes are posted either on my blog, Mia's, or both! There are two other, ah, episodes which take place generally in the same world. The first involved an invasion of my fellow bloggers along with Mia's zombies, and the second regards The Conspiracy of Zombie Glitter! 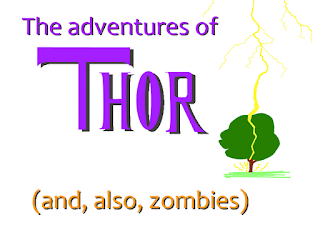 The sequel to Wheels on the Bus brings Zombie Land to the Asgardian Embassy, in Aesir Legal! With special guests, Mia, Z. Tringali, and more! 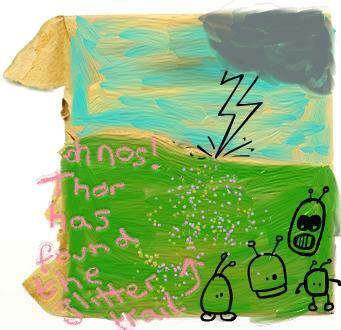 You just never know who is going to pop up in these Asgardian Embassy Adventures (new episodes on Fridays! ).